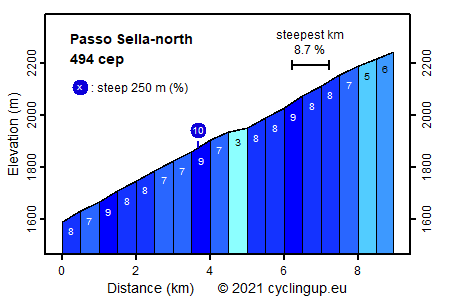 This ascent to the Passo Sella (Sellajoch in German) begins on the southern side of Wolkenstein (Selva di Val Gardena in Italian), at the point where the road turns left after a long straight section. The first part of the climb has a fairly constant slope of about 8%. In this part the Sellaronda is reached at a junction, after three and a half kilometers cycling. Here we turn right. After another kilometer with a fairly steep slope (7-9%) one can relax in an easier section (3%). After that, the slope measures 8% again, the typical value for this part of the Dolomites. After a turn to the left, one enters into a two-kilometers-long traverse ending at the Sellajochhaus, which is visible far in advance. After this building, the road turns left in the direction of the Passo Sella, 60 meters higher. For me, this pass is the most scenic point of the Sellaronda.